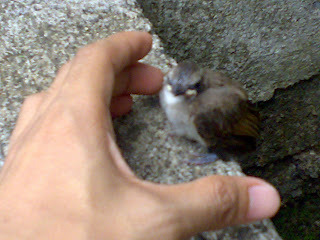 07/12 - This bird won't budge. It just won't. Then after a few minutes, it pooped then flew away. It must've been too shy to do its business while i was there. Haha! 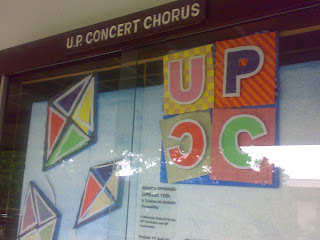 07/21 - The UP Concert Chorus bulletin board. Haha! Memories. I visited them last Saturday. They were rehearsing some choreography for their upcoming UPBeat Concert. I remember those times when I was the one leading choreography rehearsals, tough but fun. I will be watching on August 11 with my gf and also former UPCC, Liz, and also with a few more UPCC Alumni. 07/25 - (One of) Bryan's send off party(-ies). 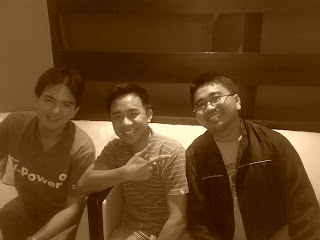 This one at the Ponte Fino Hotel with the MF Finance Dept. Bryan (who is also one of my housemates and badminton buddies) is the guy I'm pointing at. He's off to the land of the merlion to earn loads of Sing dollars and maybe learn a thing or two about GSAP. See you in December Don Bryan! 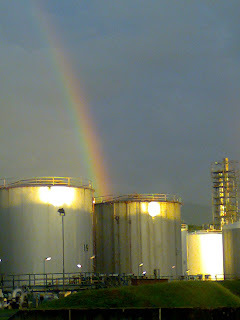 o7/26 - They say there's a pot of gold at the end of a rainbow. I still have to check, but this looks promising!